To preserve and share decades' worth of research notes and primary source materials, Gaye LeBaron donated her collection of papers to the University Library for public access and safekeeping. Working closely with her, the Library inventoried and organized her collection for use by the university community and the public. Digital access to portions of the Gaye LeBaron Collection is now possible. The Gaye LeBaron Collection is comprised of over 700 file folders with the original subject headings assigned by the columnist. Each folder contains research material gathered by Gaye LeBaron to fuel her well-conceived columns. Research notes, correspondence, memoirs, unpublished documents, newspaper clippings, photographs, and ephemera are some of the items found in these folders. The pre-processed collection arrived in banker boxes with a physical footprint of 25 linear feet. An inventory revealed a total document count of over 10,000. The collection is now stored according to archival standards. 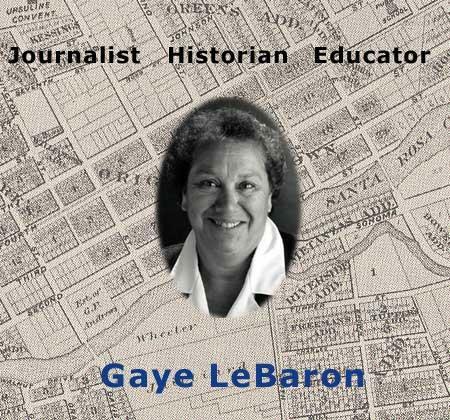 Today, Gaye LeBaron continues to expand the regional knowledge base through her teaching, writing, and community involvement. She remains a senior columnist for The Press Democrat. Who is eligible to use the collection? The collection is a public resource, available to campus and community researchers. When is the collection accessible? Access to the collection is by appointment. Call (707) 664-4152 or send e-mail to specialcollections@sonoma.edu. Are there restrictions to viewing the collection? No, but when scheduling an appointment, users will be asked to name the topic folders they wish to view. Researchers may request access to three (3) file folders, pre-selected from the Gaye LeBaron Topics list, per appointment. Are there restrictions to reproducing items from the collection? Yes, in some cases. The Library owns the items in this collection but the original author and/or publisher of each item holds the copyright. To understand the appropriate use of the material in this collection, see the section below on Copyright and Use or ask Library personnel for assistance. For more information, go to Rights & Reproductions. Are documents in the collection available online? Yes, digital versions of selected items from the collection are now available on the web. Additional items are added each week. The University Library adheres to Title 17 of the U.S. Code and other applicable copyright laws in making the Gaye LeBaron Collection accessible for reproduction and use. Additionally, the Library recognizes other legal and ethical restrictions, particularly those pertaining to privacy. Reproduction of published and unpublished materials for uses other than private study, scholarship, or research does not fall within the "fair use" doctrine of U.S. copyright law and requires permission from copyright holders. The requester must secure this permission directly from the rights holders before the Library will reproduce. Fees may apply. Many news items from The Press Democrat are found within the LeBaron Collection file folders. Reproduction for intent other than "fair use" requires permission from The Press Democrat. To reproduce and use print or electronic versions of items published in The Press Democrat, adherence to the newspaper's terms is required. Copyright law also pertains to digital versions of all items within The Gaye LeBaron Collection. To contact The Press Democrat, go to http://www.pressdemocrat.com/about. The University Library cannot counsel users in the application of copyright law but will supply basic advice on the generally acceptable ways in which items from our special collections can be used and reproduced. For more on copyright policy, go to the Library’s Rights & Reproductions of Special Materials or contact Special Collections. Gaye LeBaron's generous donation of her research papers, valuable time and historical expertise made this project possible. Substantial funds for the Gaye LeBaron Collection project were provided by The Press Democrat, with first and second year funding supplemented by The New York Times Foundation. The funds, distributed over five years beginning with 2001, enabled the University Library to preserve the physical collection and establish a model for digital collection management. The Press Democrat continues to support the project by granting selected copyright permissions and offering the use of its in-house library resources. The Sonoma State University Alumni Association donated funds for proposal writing and pre-gift planning. The Exchange Bank of Santa Rosa, our most recent sponsor, contributed funds for enhanced digital access. Lori Bowen Ayer, of the Galecia Group, for her time and technical expertise. Vonnie Matthews, The Press Democrat Librarian, for her ongoing research assistance. Dee Blackman, for her research materials.